Start your workout before getting out of your pajamas. There's this silly game some people play at Chinese restaurants. When you read your fortune cookie, you add the words "in bed" to the end of the sentence. So add "in bed" to the phrase, "you know all the best ways to shape your abs," and you might create a new exercise trend. Sounds crazy, but many people felt the same way about those big rubber workout balls. Fitness pros urge us to get our butts out of bed, so why should we exercise there? Two reasons: time management and deep core work. On those "no time for the gym" days, instead of waking up to smell the coffee, let your partner make the coffee while you wake up and activate your core. Kegels engage the muscles you'd use while waiting on an interminable ladies room line after one too many beers. 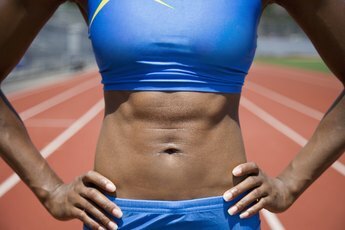 If you can't find these muscles, squeeze a pillow between your inner thighs and incorporate the pillow squeeze during crunches and other ab exercises. During exercises, such as the plank and side plank, the bed's cushy surface challenges stability. If you get a case of the wobbles, maintaining stability requires you to engage your core muscles. Once you've trained your core to respond while doing planks resting on your forearms, advance the plank by assuming a pushup position on the bed and reaching across with one hand to touch the opposite elbow. Switch sides and do only as many reps as you can do in correct form, that is, not letting your body cave from the plank position. Physical therapists teach the dead bug as a back stabilizing abdominal workout. It provides a gentle morning wake-up and centering exercise that creates a feeling of length in your upper torso. Lift your bent knees to a table top position with your shins parallel to the ceiling. Keeping your knees bent, simultaneously lower your right leg toward the bed as you raise your left arm above your head. Tighten your abdominal muscles and keep your lower back pressed into the bed. Repeat on the other side. Pick up the pace as you start to wake up. Do about 16 reps, or eight on each side. Joseph Pilates, who preached the gospel of the "powerhouse," which we now call the core, actually developed his method with patients lying on hospital beds. But don't wait till you're old or injured to reap the benefits. 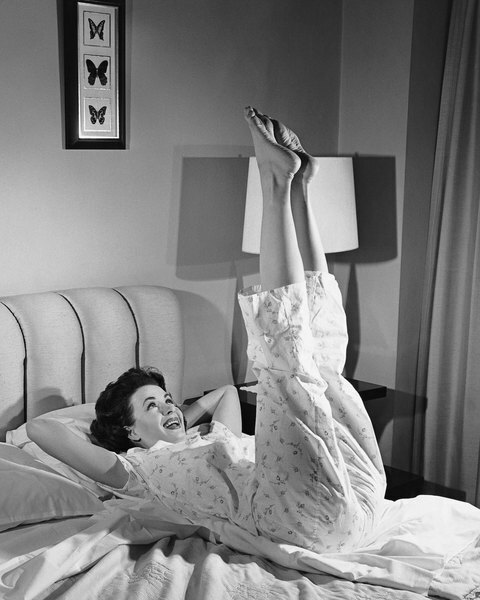 Any Pilates ab exercise easily adapts to the bed. 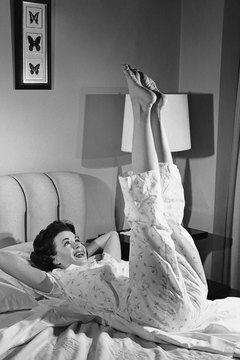 In fact, some Pilates situp variations might feel more comfortable for your spine when done in bed rather than on a mat. Another benefit is that the bed's unstable surface immediately identifies poor form, such as leaning more into one side than the other. This is a good thing. Learn from it and correct your alignment.